The Fourth of July holiday is quickly approaching. With warm weather and family events, the Fourth of July can be a fun time with great memories. But before your family celebrates, make sure everyone knows about fireworks safety. If not handled properly, fireworks can cause burn and eye injuries in kids and adults. In the recent years, six deaths were linked to fireworks and hospital emergency departments treated 9,300 fireworks injuries. The best way to protect your family is not to use any fireworks at home — period. ¬ Attend public fireworks displays, and leave the lighting to the professionals. ¬ Kids should never play with fireworks. Things like firecrackers, rockets, and sparklers are just too dangerous. If you give kids sparklers, make sure they keep them outside and away from the face, clothing, and hair. Sparklers can reach 1,800° Fahrenheit (982° Celsius) — hot enough to melt gold. ¬ Buy only legal fireworks (legal fireworks have a label with the manufacturer’s name and directions; illegal ones are unlabeled), and store them in a cool, dry place. Illegal fireworks usually go by the names M-80, M100, blockbuster, or quarterpounder. These explosives were banned in 1966, but still account for many fireworks injuries. ¬ Never try to make your own fireworks. ¬ Always use fireworks outside and have a bucket of water and a hose nearby in case of accidents. ¬ Steer clear of others — fireworks have been known to backfire or shoot off in the wrong direction. Never throw or point fireworks at someone, even in jest. ¬ Don’t hold fireworks in your hand or have any part of your body over them while lighting. Wear some sort of eye protection, and avoid carrying fireworks in your pocket — the friction could set them off. ¬ Point fireworks away from homes, and keep away from brush and leaves and flammable substances. Local fire departments respond to more 50,000 fires caused by fireworks each year. ¬ Light one firework at a time (not in glass or metal containers), and never relight a dud. ¬ Don’t allow kids to pick up pieces of fireworks after an event. Some may still be ignited and can explode at any time. ¬ Soak all fireworks in a bucket of water before throwing them in the trash can. ¬ Think about your pet or nearby animals. Animals have sensitive ears and can be extremely frightened or stressed on the Fourth of July. Keep pets indoors to reduce the risk that they’ll run loose or get injured. ¬ If a child is injured by fireworks, immediately go to a doctor or hospital. If an eye injury occurs, don’t allow your child to touch or rub it, as this may cause even more damage. Also, don’t flush the eye out with water or attempt to put any ointment on it. Instead, cut out the bottom of a paper cup, place it around the eye, and immediately seek medical attention — your child’s eyesight may depend on it. If it’s a burn, remove clothing from the burned area and run cool, not cold, water over the burn (do not use ice). Call your doctor immediately. Fireworks are meant to be enjoyed, but you’ll enjoy them much more knowing your family is safe. Take extra precautions this Fourth of July and your holiday will be a blast! Flash floods and floods are the #1 storm related killer in Kentucky and across the United States. If Driving, DO NOT DRIVE THROUGH FLOODED AREAS! Even if it looks shallow enough to cross. The majority of deaths due to flooding are due to people driving through flooded areas. Water only one foot deep and displace 1500 pounds! Two feet of water can easily carry most vehicles. Roadways concealed by flood waters may not be intact. If caught outside, go to higher ground immediately! Avoid small rivers or streams, low spots, culverts, or ravines. Do not try to walk through flowing water more than ankle deep, as it only takes six inches of water to knock you off your feet. Do not allow children to play around streams, drainage ditches, or viaducts, storm drains, or other flooded areas. If ordered to evacuate or if rising water is threatening, leave immediately and get to higher ground. Lightning is the number two storm related killer. In Kentucky, more people are killed by lightning in an average year than tornadoes. Although severe thunderstorm warnings are NOT issued for lightning, you should move to shelter when thunder is heard as lightning can strike 10 to 15 miles away from where the rain is falling. If outside, go to a safe shelter immediately, such as inside a sturdy building. A hard top automobile with the windows up can also offer fair protection. If you feel you hair standing on end, squat with your head between your knees. Do not lie flat! If inside, avoid using the telephone (except for emergencies) or other electrical appliances. If an underground shelter is not available, move to a small interior room or hallway on the lowest floor and get under a sturdy piece of furniture. Put as many walls as possible between you and the outdoors. Do not try to outrun a tornado in your car; instead, leave it immediately for safe shelter. Do not seek shelter in an underpass. Be aware of flying debris. Flying debris from tornadoes and high winds causes most fatalities and injuries. Mobile homes, even if tied down, offer little protection from tornadoes or high winds. You should leave a mobile home and go to the lowest floor of a sturdy building or storm shelter. When possible, avoid outdoor activities during the hours between 10 AM and 4 PM, when the sun’s rays are the strongest. Always wear a broad-spectrum (protection against both UVA and UVB) sunscreen with a Sun Protection Factor (SPF) of 15 or higher. Be sure to reapply sunscreen frequently, especially after swimming, perspiring heavily or drying off with a towel. Wear clothing to protect as much skin as possible. Long-sleeved shirts, long pants, or long skirts are the most protective. Dark colors provide more protection than light colors by preventing more UV rays from reaching your skin. A tightly woven fabric provides greater protection than loosely woven fabric. To protect your eyes from sun damage, wear sunglasses that block 99 to 100-percent of UVA and UVB radiation. Consider wearing cosmetics and lip protectors with an SPF of at least 15 to protect your skin year-round. Swimmers should remember to regularly reapply sunscreen. UV rays reflect off water and sand, increasing the intensity of UV radiation. Some medications, such as antibiotics, can increase your skin’s sensitivity to the sun. Ask your doctor or pharmacist for more information about the medications you are taking. Children need extra protection from the sun. One or two blistering sunburns before the age of 18 dramatically increases the risk of skin cancer. Encourage children to play in the shade, wear protective clothing and apply sunscreen regularly. Flash floods and floods are the #1 storm related killer in Kentucky and across the United States. Each year, more deaths occur due to flooding than from any other severe weather related hazard. Estill County and many other areas of Kentucky have already began to experience how quickly waters can rise. With the ground heavily saturated any other rain fall, especially heavy rain can cause some flooding. People underestimate the force and power of water. More than half of all flood related deaths result from vehicles being swept downstream. Most of these drownings are preventable. If flooding occurs, get to higher ground. Get out of areas subject to flooding. This includes dips, low spots, canyons, washes, etc. Avoid areas already flooded, especially if the water is flowing fast. Do not camp or park your vehicle along streams and washes, particularly during threatening weather conditions. Do not attempt to drive across flowing streams. Roadbeds may be washed out underneath the flood waters. Be especially cautious at night when it is harder to recognize flood dangers. The National Weather Service has developed an easy to remember way of staying safe during floods, TADD – Turn Around Don’t Drown. During times of severe weather remember to monitor your NOAA Weather Radio, or your favorite news source for vital weather related information. 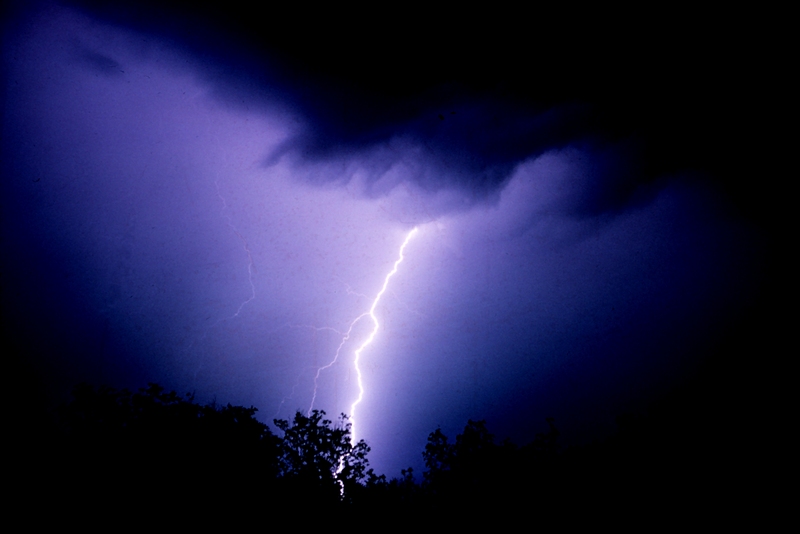 In the United States there are an estimated twenty-five million lightning flashes every year! These are some pretty staggering numbers and if you are struck by lightning they don’t paint a very pretty picture. So what is the best way to keep from being struck by this amazing force of nature? Do your best to stay away from it. Lightning is the number two storm related killer. In Kentucky, more people are killed by lightning in an average year than tornadoes. Although severe thunderstorm warnings are NOT necessarily issued for lightning, you should move to shelter when thunder is heard as lightning can strike 10 to 15 miles away from where rain is falling or where the storm appears to be. Keep these safety tips in mind and stay away from the potentially deadly effects of lightning strikes. Visit the National Weather Service’s Website for more on lightning safety and the science of lightning. Most people are not formally trained on how to drive in hazardous weather conditions. Many people become very nervous and then confusion prevails. Here are some driving tips to help you steer clear of trouble when driving in heavy rain, sleet, snow or ice. SLOW DOWN – It does not matter what type of vehicle you are driving, when driving in hazardous weather slowing down gives you a few more seconds to react when trouble occurs. LOOK AHEAD – Watch ahead for possible trouble spots. Looking ahead gives you a few more seconds to react which can be the difference in almost being in an accident and actually having one. WIPERS ON, LIGHTS ON – Whenever daytime visibility is less than ideal, turning on your lights allows you to see, and to be seen by others. Remember this rule of thumb: wipers on, lights on. Also remember cars equipped with daytime running lights still need to turn their lights on. Daytime running lights are only a low headlight, your tail lights are not on at all. When traveling in snowy weather, remember to clear tail lights, signal lights, and headlamps regularly. DON’T OVER ESTIMATE – The capability of four-wheel-drive vehicles is greater than other vehicles, but not limitless. Many drivers mistakenly believe that four-wheel drive is all powerful. Every type of vehicle depends on four small contact patches where the tire meets the road for traction. This small contact area is the limiting factor of any vehicle on a slippery surface. Four-wheel drive does not improve braking or cornering effectiveness. DON’T OVER REACT – Many people believe that quick reactions make a good driver. The world’s best drivers are trained to anticipate f problems early and direct the vehicle appropriately before they become involved in a problem. Reacting too quickly can be dangerous if the driver’s response is inappropriate. KEEP MOMENTUM – Gain speed and momentum on the flat before starting uphill. When the car begins to slow down going up the hill, ease up on the accelerator, allow the car to slow down and crest the hill slowly. If you try and accelerate too hard and spin the wheels, you may lose momentum and not make the top. It’s better to make the top at a slower speed than to not make it at all. MOST IMPORTANTLY – If you don’t have to go out don’t. It is always best to refrain from driving in hazardous weather. If it is absolutely necessary for you to leave try to wait until road crews have cleared the roads. Main roadways are usually cleared quickly, so you shouldn’t have to wait long. Remember just because the road has been cleared and salted doesn’t mean there are not still slick spots on the roadway. The Estill County Emergency Management Agency (EMA)/ Chemical Stockpile Emergency Preparedness Program (CSEPP) is beginning a CSEPP Zone Sign project. You will begin to notice signs being placed throughout the county by County and State Highway Departments. We have encouraged residents for years to know what their CSEPP Zone is in case of a chemical emergency at the Blue Grass Army Depot. Should an accident occur at the Depot we will notify residents by their zone on what actions they need to take to keep themselves and their families safe. These signs are just another way for us to educate the community on what zone they are in. Our hope is that these new signs will help residents know what zones they live, work or visit frequently. Knowing you zone is just part of having a Family Emergency Plan. We encourage everyone to create an Emergency Plan and build a Disaster Kit. Find us on FB; Estill County EMA/CSEPP, or call us (606) 723-6533.